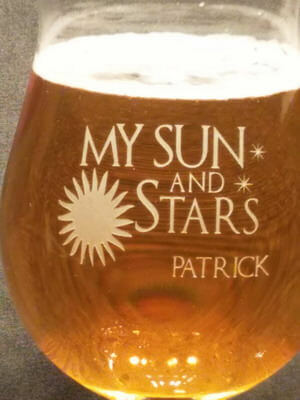 The Personalized Engraved Crystal Belgian Beer Goblet is personalized to your liking! Made in Europe from brilliant lead-free crystal, this engraved Belgian beer glass contains trace amounts of titanium for added brilliance and strength. Durable and elegant. It can be customized with text, design, logo, pretty much anything you want! The picture above is just an example of my work, you can get this glass with whatever you'd like on it. This glass is 6.25 inches tall and holds 18.75 ounces. 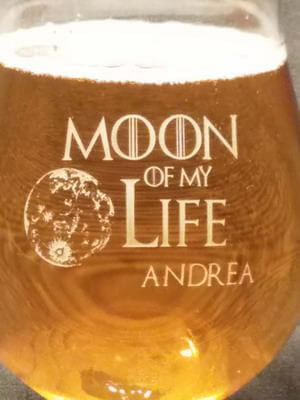 Personalization, text and/or design, on the front of the beer glass is free, other options are available for an additional fee. We suggest keeping your text to 4 lines of 18 characters per line, it is okay to go over, it may just be smaller to fit it on the glass.